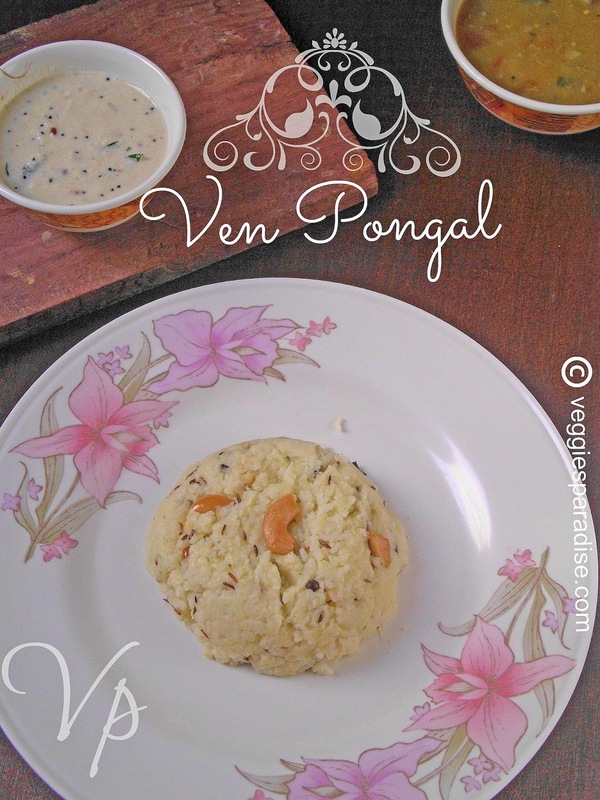 VEN PONGAL - This is yet another popular and delicious breakfast recipe in South India, particularly in Tamil Nadu. I could say this is one of the simplest recipe that is prepared with only two ingredients, rice and moongdal . Third - Both are mixed together. There are different versions of preparing pongal and based on the way we cook the taste also differs a lot. Eventhough I have mentioned as the simplest recipe, there is always a good technique behind in preparing tasty pongal. 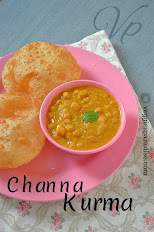 Ghee plays a vital role in this dish as it enriches the taste , so don't avoid it. In my version rice and moongdal is cooked and tempered with cumin , pepper, ginger, curry leaves and cashews sauted in ghee. 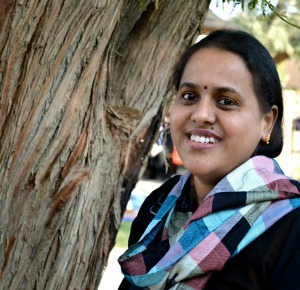 I use pressure cooker to prepare my pongal, I know everyone uses the same way as I do as we all want to finish our cooking in a jiffy, but my MIL's preparation is entirely in a different way, she cooks the pongal in a heavy bottomed vessel without using the cooker and the tempering part is done with the homemade ghee. The taste is completely different and unique. My daughter always rates my MIL's recipe as the best and when I ask about my dish , so far I get only Ok or BETTER and you know all my weekends starts with pongal as breakfast as my lil one loves it. The only difficulty in my MIL's version is patience, So friends , if you find time ,do try out preparing pongal without using pressure cooker and see the difference. Wash and pressure cook the rice and moongdal, along with salt and green chillies,for about 5-6 whistles. Heat ghee, fry the cashews until golden brown and keep it aside. Now add the remaining ingredients mentioned under tempering,fry it well. When the pressure is down, add the tempered ingredients and mix well. Don't skip ginger as it enhances the flavor of the pongal. For more hot version , you can crush few black peppers and mix well, in this way peppery pongal is ready. Looks so nice,amma also prepares ths without using the pressure cooker,the tast will be divine as ur doter says.. Very yummy pongal, my all time favorite. This pongal I like very much... thanks for sharing Dear..
Looks delicious and nicely presented. never tried on pot,quite interesting,shld try sometime. 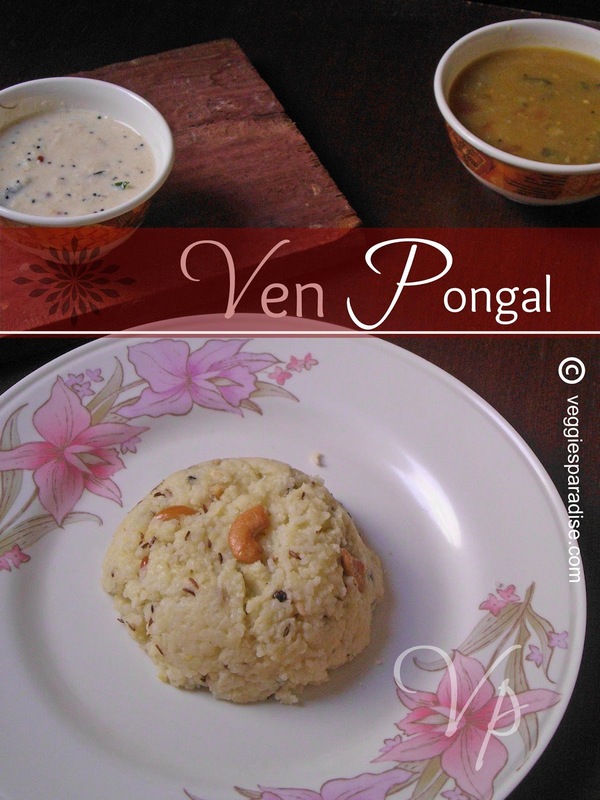 Love Venpongal.. My all time comfort food..
A simple and delicious pongal! A staple breakfast at home! Looks delicious! Who will say no to Pongal, my favourite breakfast. Ghee pongal looks superb! Very healthy too. Looks yummy and nice presentation. An all time favorite, would try out your way the next time..
Love Ven Pongal n its our constant weekend breakfast :) U have made it perfectly..looks so inviting n delicious!